Cruise only price does not include arrival/departure transfers. Amsterdam to Basel: Embarkation will begin at 2 pm however early arrivals may rest in the lounge if their assigned cabin is not ready upon check-in. Passengers returning from Basel on Day 9 should select flights that depart no earlier than 8:00 am. 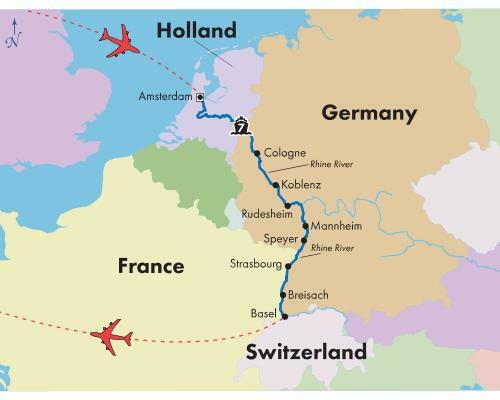 Basel to Amsterdam: Passengers arriving to Basel on Day 2 should select flights that arrive no later than 6:00 pm. Embarkation will begin at 2 pm however early arrivals may rest in the lounge if their assigned cabin is not ready upon check-in. Due to physical constraints and space limitations, wheelchairs and walkers are not allowed on motor coaches and/or river cruises. There are no elevators or chair lifts on board. While sailing with Monarch Cruises, passengers are subject to the cruise's Terms & Conditions.